Treat your guests to a unforgettable destination event at the picturesque Fisherman's Wharf in San Francisco. Breath in the tranquil fog floating through the Golden Gate Bridge. Hear the bells of the Historic Cable Cars passing you by. Taste the delectable fresh catch of the day. Getting excited yet? Perfectly located, Holiday Inn Fisherman's Wharf is just steps away from San Francisco's most iconic attractions: Pier 39, Alcatraz tours, Cable Car turnarounds, Lombard "Crookedest" Street, Coit Tower, Ghirardelli Square, and sweeping views of the Golden Gate Bridge. With nearly 5,000 square feet of flexible event space, our hotel is ideal for events ranging from 15 to 300 attendees. All the event space is located on our mezzanine, creating a convenient and private environment for events. 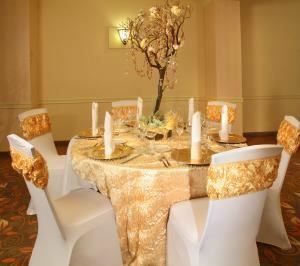 Whether you are planning a casual affair or an extravagant wedding, our experienced onsite conference services staff provides personalized assistance to ensure your event's success! Flexible configuration of 3,400 to 4,000 square feet of space, this room is ideal for banquet and corporate events for up to 300 attendees. Special Features: Sunlight through windows. Flexible configuration. Can be split into 4 rooms. Attractive event space with direct sunlight ideal for up to 60 attendees.